Okay, this is a bit of a stretch, but today I am working on God-themed projects day and night. By daylight, we are sending out our first e-newsletter about “The God Box” and responding to some wonderful early reviews. Then after dark, Chelsea and I head to the premiere of “God Save My Shoes”, a new documentary about women’s infatuation with their shoes. Oddly enough, I am actually in the film. Most of the women in the film are head over heels (forgive me) for their Christian Louboutin’s, some squirreling away as many as 1200 pairs. I’m featured as a consumer expert, analyzing the psychology of why women feel the way they do about their shoes. The crew shot the interview in my office and I happened to mention women’s habits of stowing multiple backup shoes under their desks. The producer asked, “Do you have any? “ So I dove under my desk and came up with six motley pairs of shoes, ranging from sandals to sneakers to Croc’s, not exactly designer wear. That embarrassing discovery is in the movie! So, what’s the connection between the two stories? Mom and I shoe-shopped all the time. We preferred discount stores so I loved to treat her to great deals that she could bring home to model for Dad. Even though Mom favored the comfy sandals that suited her Florida retired lifestyle, she always liked a little flash– the Lucite heel, the sparkly bling. Guess the connection is…a woman can never have too many shoes…or too much faith. Presenting the first copies of my upcoming book “The God Box: Sharing my mother’s gift of faith, love and letting go”. They just arrived on Monday night and I am so pleased. A symphony of robin’s egg blue! This book cover was designed by the fabulous Rachel Cost (graphic designer) and the magical Lissa Lowe (marketing/creative director of the God Box Project). From the moment I first saw the concept, my heart soared. There is something peaceful about the purity of this blue. This color is all around my home in Pennsylvania—the color on the walls (Benjamin Moore Pure Essence if you’re interested! ), a old painted armoire and even the occasional broken eggshell left behind by a baby robin ready to fly. 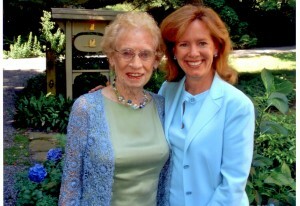 I have a favorite photo of my Mom and me where we are a rainbow of aquas and blues and green. Our eyes even match the blue. So, this book says “Mom” to me, even before page one. I hope it will speak the language of comfort and calm and joy to you too. I added the photo of the stack of books to my on @Pinterest here. Join me there. 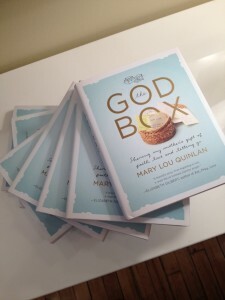 I just received the very first copy of “The God Box” from the printer. I look happy because I am. But inside, I feel so much more. I have worked on this story in one way or another since my Mom died in 2006. 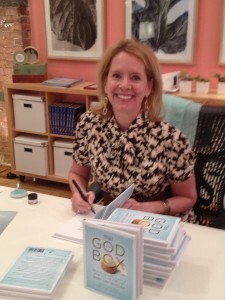 First, it was just a little family tale I shared, then an article in Real Simple magazine and then beginning January of 2010, a full-fledged commitment to what’s grown to be The God Box Project. The past year and a half have been the most intense, digging back through my memories, back through the little scraps of paper she left behind. I’ve laughed and cried and best of all, reconnected with Mom in the process. Writing about my family has been one of the most rewarding , difficult and joyful things I’ve ever done. The reward is that I’ve started to dream about my Mom. I was always a vivid dreamer-full color, action, music!- and yet for years after I lost Mom, she never turned up at night. But while writing this book, she’s front and center on my pillow, showing up in all kinds of happy, funny, beautiful moments, as if she were just part of my life. So, while some friends have commented, “I could never re-live such a sad time in my mother’s life,” it’s actually been rejuvenating for me, like having her back every day. The difficult part of creating this book is that I want it to be perfect, as she was to me. I want to honor her legacy and tenderness for my brother and his family and for her many friends. Knowing that it’s printed and real, means it’s time to let it go and believe that it is enough. Mom was never about perfection. She was just about love. And if the God Box helps others learn from her life and perhaps start their own God Boxes….well, that is the happiest thing of all. Here’s to you, Mom. Hands on. Sunday’s are always my clean up days. The kitchen, the closets, the garden. My puttering and polishing instinct kick in and in an oddly busy way, I feel incredibly peaceful. That’s how my brain works. How could I have done it better? So, maybe this is a sign from Mom. She would have said, “Maybe this was meant to be. Maybe you needed a day to just not do anything”. Okay, I accept that. 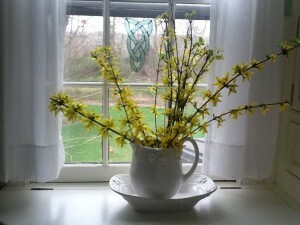 Does cutting some forsythia to hurry spring into our house count? Looking forward to a fresh week of The God Box. Okay, so my upcoming book is about how my Mom taught me to let go. And with just one day standing between me and the delivery of my first actual finished book, I am a ball of nerves. I never had a baby so it’s hardly fair to even breathe the comparison but I feel as like I’m anticipating the delivery of a brand new baby book. Except this baby is on a slow truck coming from Minnesota. Other shipments of books are on their way to bookstores and PR folks but for whatever reason, their trucks have already sped to their destination, and here I sit, tick, tick, tick till tomorrow. 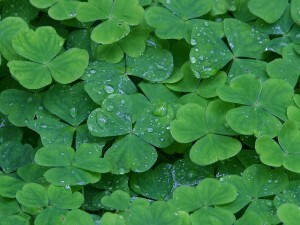 So to calm down, I thought I would take a peek at my garden. 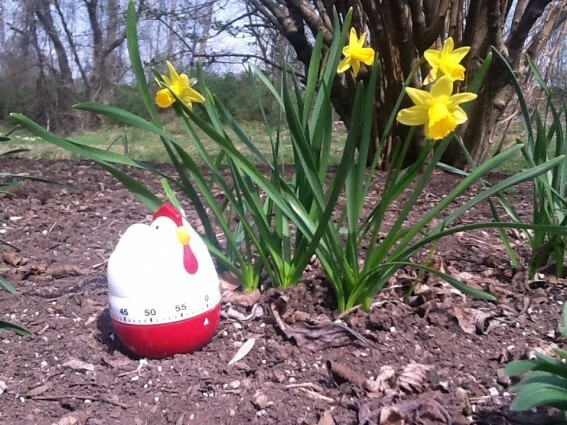 Spring is on a fast track in Pennsylvania and the daffodils are already looking blasé since they’ve been up for a week with the warm weather. And it looks like the May azalea and wisteria are ready to give the daff’s an early run for their money. Now I am staring at the dirt wishing them all to grow faster because a newspaper photographer is interested in shooting my Mom’s garden but only when the flowers are in full bloom. 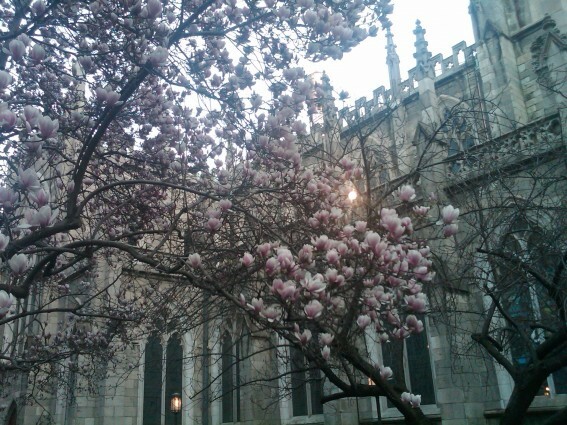 Will they bloom before the books hit Barnes & Noble? Can I cheerlead the peonies into full glory ASAP? The irony of wishing this all hurry-up stuff is crazy. Mom was all about enjoying life, accepting what came her way. 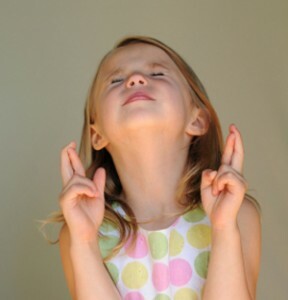 But then again, she sure could stuff her God Box full of “please’s” when she wanted something really bad. So, happily maybe I am my mother’s daughter, in more ways than I know. 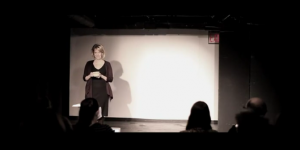 Ever wonder what it’s like to become an actor, not that making powerpoint presentations at work isn’t a thrill? Check out my new blog on Huffington Post and the backstory on Mom, the woman backstage behind me all the way. Click here for the full story. My Mom was always encouraging me to go onstage. She wasn’t a stagemother like Mama Rose but she was certainly ready to stand behind whatever talent I could muster. She was the architect of my theatre ambition, signing me up for tap, ballet and jazz lessons (my faves thanks to the costumes and the shoes! ), putting me in the choir (a weak soprano), and sending me to the convent for piano lessons. I’m a good dancer but just an okay singer but that never stopped me from belting out “Funny Girl” and believing I was just a hair off Barbra. A grade school friend who reached out on facebook told me that once I actually walked up and down the aisles of our classroom, singing to the students. I was a Gleek before there was one. The piano lessons never worked. My Mom and Dad put the old upright down in our basement so that they could shut the door on me while I practiced. I can remember banging away so badly that even our dog Andy would climb to the top of the steps and scratch the door to be released from musical prison. But my acting bones grew strong from high school and college plays and then morphed into a career of making new business presentations and speeches–not exactly theater. Mom never gave up though. With every book I wrote, she used to say, “You should get on Oprah!” “You should have her job!” Yeah, right. Now, six years after losing my Mom, I am going for it. I’ve been working with a terrific playwright and director named Martha Wollner who’s with the LABYrinth Theater in New York. And I’ve been developing and rehearsing the script of the “The God Box” with her. This blog on today’s Huffington Post tells the tale. Hey, Mom. I did it. Thanks for all those years of waiting in the wings. Your turn to take a bow. There are so many things to feel awful about in the world today. Wars, violence, terrible diseases, families torn apart, where to even end the list of tragedies and worries? Yet, it’s easy to find myself complaining about some small inconvenience or setback. Yes, we have family illnesses, yes, we have had loss and worries but we want to remind ourselves how truly blessed we are to have wonderful people in our lives, to have the chance to do work we love, to be alive. I guess it might seem wishful or corny but you’d be surprised how this simple reminder puts a lot of gratitude and a little luck in every day. I guess some might say that I’m a pleaser because I’d generally rather make people happy than tick them off. My Mom was familiar with this quirk of mine because I used to call her moaning that I’d agreed to something that I regretted. Both my parents were much better at protecting their personal time and space. If Dad wanted to bail out of a crowded event, Dad would just slowly slide his chair inch by inch, closer and closer to the exit until he silently vanished, avoiding the whining “Why are you leaving so soon?” goodbye. My Mom was quicker to the punch. She hated being forced into a yes that left a pit in her stomach. So Mom came up with her own mantra, “Just say yes. You can always say no later.” It’s not that she wasn’t telling the truth. She often stuck with her yes. But occasionally, it was the perfect way to deal with others’ on-the-spot requests. I have to say that it works. All the guilt is delayed and the somehow the ‘no’ lands softer with the passage of time. Maybe you can try it out this weekend. “Yes, I’ll go with you to that painful 6am spinning class on Saturday” and then, “Whoops, the alarm didn’t go off!” And snooze your morning away. You might not ever do this but it’s nice to know you can. Mom said so.